I’ve been in my new home in Badlands National Park for just over two weeks now. I arrived here in summer, and within a week the autumnal equinox carried us over into fall. On cue, the cottonwood trees turned from green to gold, and the nights became crisp and clear. On Saturday night, I sat outside my back door, watching the dramatic rise of the harvest moon over the badlands formations. My grad school friend Rachel had just arrived for a brief visit as she made her way across the country, and after being trapped in a car for fourteen hours she was eager to go for a moonlit walk. We picked our way slowly and carefully over the uneven, poorly-consolidated sediments of the formations. I pointed out the handful of grass species I could identify in the unfamiliar night light—the false-eyelash seedheads of blue grama; the low, curling growth of buffalo grass; the coarse plumes of crested wheatgrass. We wandered in a great circle, crossing a narrow path of moonshadowed hoofmarks that denoted a heavily-used deer trail. As we meandered among the badlands, I wondered at myself for having never before taken a full moon stroll in the rolling prairie. I worked here at Badlands National Park for two six-month seasons before going back to school for my master’s degree, but then, I was only here during the blizzard-prone winter months. Arriving when I did, in November, the nights were long and cold and windy. Those prairie winds are no joke. They proved very effective at keeping me indoors. 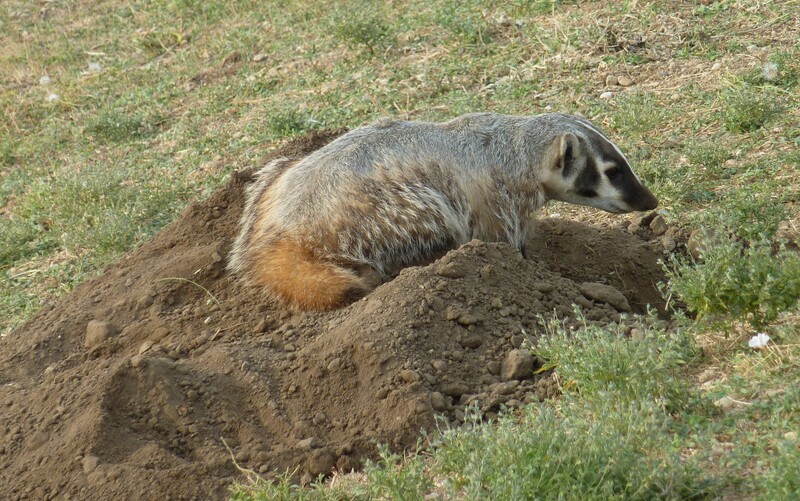 A badger takes a quick break from using its claws to excavate a burrow. But the wind and weather are just an excuse, of course. I’m entirely sure that there were some beautiful nights when I didn’t go exploring. Even when the weather was bad, I know from experience that it can be fun to be outside in almost any weather as long as you dress appropriately. No: the real reason I didn’t go out exploring at night, back when I was in the park as a seasonal, was because I didn’t have anyone to explore with. The real reason that I was out on this particular Saturday night, looking at centipedes rippling over rocks and casting eerie many-legged shadows by moonlight, was that Rachel was here as an instigator. I love having the chance to show friends around my national park backyard, especially when they—like Rachel—share my naturalist inclinations. Luckily, our time in the park wasn’t limited to one night. We spent all day yesterday touring around the park, hiking the trails and watching wildlife at the prairie dog towns. 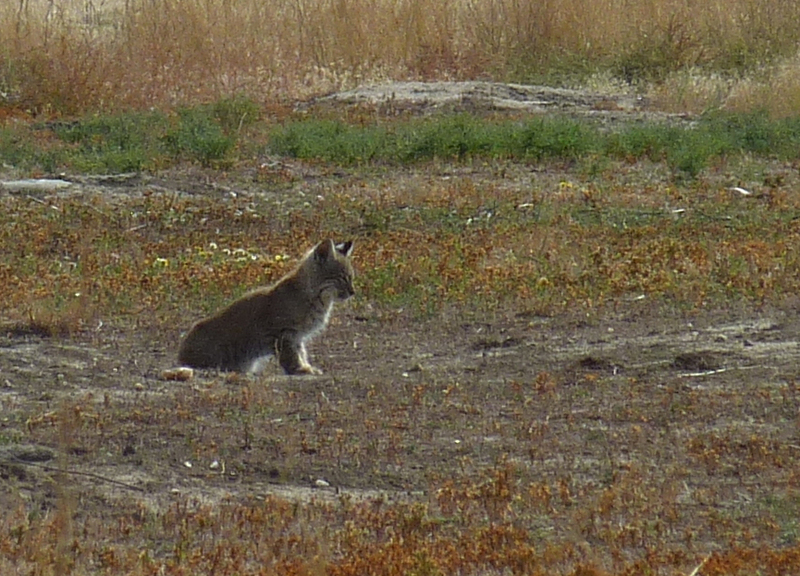 A young bobcat attentively eyes nearby prairie dogs. Prairie dog towns are my favorite places to look for wild animals, here in Badlands. It’s not just the prairie dogs that you see. Those little, chirruping rodents are also a magnet for hungry predators. Within the span of just a few hours, Rachel and I saw a young bobcat trying (very unsuccessfully) to sneak up and pounce on a prairie dog, a badger burrowing earnestly near the roadside, a family of coyotes greeting each other, and a lovely dark-morph ferruginous hawk circling overhead. The animals, like us, are alert to the shift in the seasons. While we admire the changing palette on the landscape, herbivores like prairie dogs industriously prepare for winter, eating as much as they can before the hard winter ahead. Young predators like the bobcat, born this spring, need to polish their hunting skills if they are to make it to their first birthday. Me, I have it easy. I can bask in the unexpected warmth of an autumn day, snapping pictures of the carmine skunkbrush and orangey-yellow cottonwoods as they glow against the dried-up prairie grasses. I revel in the knowledge that this time, I’m here for a few years: long enough to take in the give and sway as one season yields to another, here in the Dakota grasslands. Badger and bobcat. How cool is that! Badlands is the best place I’ve ever lived for consistently seeing badgers. This kitten was the first bobcat I’ve seen here, though that’s mostly because of bad luck and lack of diligence on my part!